Kyle Payne - Siegmund Excavation & Construction, Inc.
2018 was an amazing year for Kyle Payne. It began with him starting a new job at Siegmund Excavation & Construction in January, and ended with the birth of his first child. Kyle worked for McCallum Rock Drilling for 11 years, running rock drills and blasting. 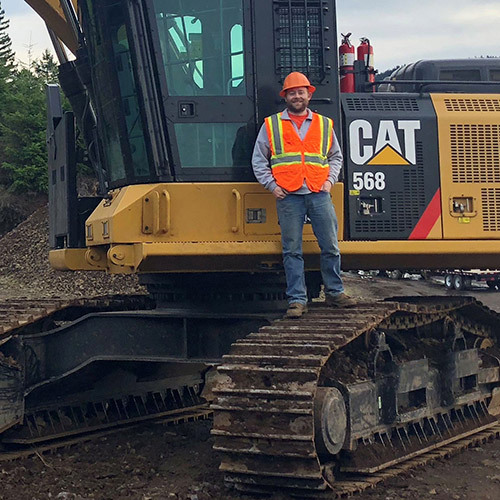 Kyle says working around many types of heavy equipment while at McCallum slowly sparked his interest in wanting to run other types of equipment. This is what lead him to Siegmund. Kyle grew up in Centralia, Washington where he played football and baseball when he was young. Baseball was big in Kyle’s family. Both he and his younger brother played the sport throughout their school careers. The family spent many of their summers at baseball tournaments, cheering on both boys. They also enjoyed hunting, fishing, and camping, especially at their beach property in Washington where they’d spend their days digging razor clams. Kyle moved to Oregon six years ago. Two years later he met his beautiful wife, Josie. The couple enjoys hunting and fishing. They often take their travel trailer into the woods to camp while they are hunting. Kyle and Josie welcomed their first baby in December. They are excited to take their son out camping and introduce him to all of the things they love to do in the outdoors.